320x240 pixels at an AMAZING PRICE! Now every technician can afford to keep an E-Series camera handy for quick equipment scans and safety checks. 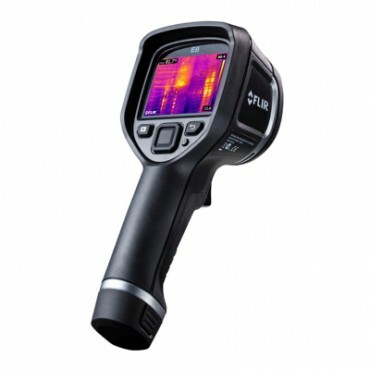 Easier to use than an iPhone, FLIR’s newest line of economical thermal imagers offers everything you need for on-the-spot thermal inspections. These are invaluable tools that can help you clearly see and find hidden electrical and mechanical overheating in time to stop problems from turning into serious, expensive trouble. With an E8, you’ll become a well-armed preventive action hero. If you plan to share saved images with customers or coworkers, a thermal image alone isn’t always enough to help them understand what they’re seeing. That’s why FLIR developed MSX® Multi-Spectral Dynamic Imaging to bring together the best of both spectrums in a striking, innovative way. Now onboard the full line of new FLIR E-Series and T-Series cameras, MSX instantaneously generates a definitive, all-in-one thermal picture that easily orients you to the location of the problem as soon you see it on the screen or in a report. No more guesswork or messing around with extra photos.